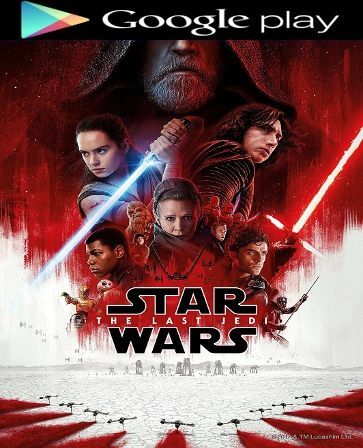 Digital UltraViolet and Digital Copy will makes it possible for you to stream the movie Star Wars: The Last Jedi HD Google Play Code instantly to your computer and compatible Smartphones, Andriod, iphone, iPod Touch, iPad and tablets devices anytime, anywhere. You can also download a Digital UltraViolet Copy or a Digital Copy of the movie Star Wars: The Last Jedi HD Google Play Code to your computer and compatible devices. Last Jedi is as good as any Star Wars, I don't know why some fans complain about how the story handled Luke, face it, he's almost as old in this movie as Obiwan Kenobi in episode 4 and he doesn't care about the Jedi thing anymore. Great choice for the unfolding of events. Why expect Luke to jump back in the Jedi bandwagon again and relive the nightmares he went through already. The guy has had it. As for for Snoke, getting slashed, who cares if they didn't develop his character more, he's just another bad guy like Boba Fett, General Grievous or Count Dooku, all got wasted and nobody complained back then. And Leia used the force in empty space to save her own life, brilliant. Another thing is please stop attacking this awesome Rose Tico, she was great. People blast her for being Asian, nobody blasts Finn for being black, get real. I want to see this movie 5 or 6 more times to grasp everything it has, well done Rian Johnson.